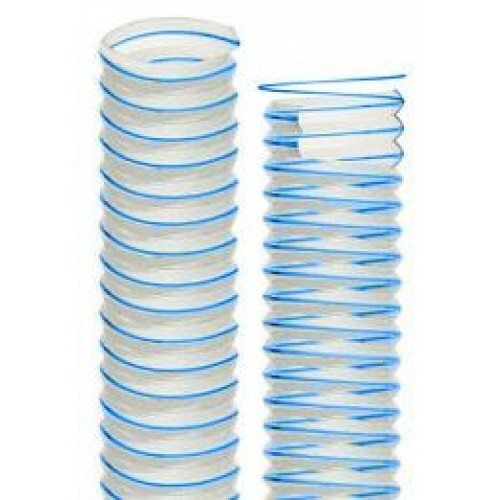 Technical Features: Ester based Polyurethane duct reinforced with a steel wire coated with blue Polyurethane. Wall thickness from 0,4 to 0,65mm. Properties: Very light and flexible, easy to handle. The wire is embedded between two PU plies for ensuring a better adhesion and really good performance in bending. Halogens free conform to RoHSand phthalates free. Standards: It can be made electrically bonded by earthing the steel spiral in accordance to TRB S 2153. The electrical resistance R ≤ 102 Ohm/m is according to ISO 8031 - ATEX Directive 94/4/EC and 99/92/EC). For dry food only according to EU Regulation, RoHS 2011/65/EU Directive, REACH Regulation (1907/2006). Specifically manufactured for dynamic applications in woodworking industry: suction of pellets, saw dust, abrasive powders. Also suitable in food industry for dry food only.